As the book’s source notes confirm, such text “uses and spins off from” medieval Anglo-Saxon quest poetry, making Drift at least partially a crisp but dauntingly abstracted series of translations. Mercy is not spared for the reader, who must read cryptically along the wash and noise of a dense set of song cycles. 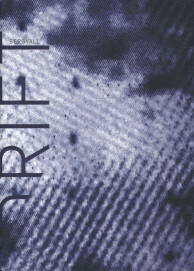 We are given the gift of anonymity by being readers: in the case of Drift, there is the anonymity of truth, of authorship, and of Bergvall’s conceptual conditionings and constraints. Beat bells blow foghorns! Gebangbang for rumbly lowe! Will it come from the naught, bringing phobias and rationing? Drift brings us statements and questions and deciphering and none of it is neat, as it need not be. Its joy is one of endurance, of fatigue, and of engaging an environment of poetry larger than ego, fathomable and intense. That which is represented is then tweaked, morphed, sculpted. But why? The reader must hold off answering until the book’s finale. Truth is a moment of climax and authority, but the journey must be undertaken for the lessons to be learned. No clearer has the poet provided truth in journey than through “Report,” arguably the most powerful and the most anonymous space of the book. In it we follow, through ghostly reports and pixelated images, the deadly journey of Libyan migrants toward Italy. Their failed quest poses the ultimate question: why were they allowed to die? But more importantly, Bergvall’s own audacity to print this spectrum of her path of inquiry provokes, pokes, and prods the reader to dread in ways medieval poetry cannot. “This compass and the stars were their only means of orientation at this point,” she writes. And yet the language maintains a distance, a coldness, an anonymity. The poet is alive amidst the forceful, displacing currents of the tide. Bergvall’s cunning poetry is born out of ideas. At the end of Drift, she provides the reader with a day journal, called “Log,” filled with hopes and imaginations. “To remind myself that this project is not an exercise in translation, however closely I work with the original text. It is a template for writing. And for excavating language. For finding the teeth of my own text, for locating its workable memory trails” Her insight is precious; it sorts out value for us, and becomes the warm heart of anthropology within an array of messy movements, of poetic image and sonic buzz scattered throughout the 185 pages of Drift. Reading them, we enter what feels maddening, and incorrigibly raw: the captain’s chambers in a gargantuan craft floating across an abyss of vision. This entry was posted in Uncategorized and tagged Summer 2015 on September 1, 2015 by Kelly.